The waxflower is a flowering shrub that comes from the myrtle family. The leaves are similar to that of the tea tree and produces blooms. These are often considered to be a native to parts of Australia. The blooms often last for some time after harvesting earning the name. Because of the long lasting flowers, it is a popular garden staple. Cultivation has made it possible to grow these in other locations. Chamelaucium unicatum is one of the best known species in the family. It is often called Geraldton wax and is a medium size flowering shrub. The blooms are often pink or white, and may include some variations. The plant grows upright and does not spread out like some shrubs. For this reason, they may be planted in clusters to cover ground. They are also often added with shorter or more dense plants for cover. Chamelaucium ciliatum is a spreading shrub that grows three feet high. The dark green leaves are highly aromatic when pressed or crushed. Small pink or white flowers often appear and may age to darker pink. This species is often called Stirling wax and can be hard to start. Cuttings from stems are often the best way to create new plants. Grafting has also shown promise for creating new plants from stems. 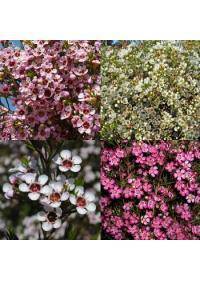 It is possible to plant a waxflower in any season, save for winter. This makes it easy for gardeners to plant when the garden is prepared. Spring and autumn are often recommended for the best planting times. Soil may need to be prepared before any of the plants can be planted. Organic matter is a top additive to provide moisture and nutrients. It can also help to encourage good drainage of the soil in gardens. For warmer climates, sandy soil may be preferred by the waxflowers. If the soil does not contain sand, it can be added to the garden. The balance of sand should be controlled for the best growth possible. Fertilizers are often used about three weeks after initial planting. Depending on plant condition, it may need reapplied during growing. Bloom enhancers may also be used to encourage stronger flowering. Watering is not as great of a concern as many are drought resistant. A lack of water can decrease the amount of blooms that will form. Care should be taken to avoid over watering as it promotes decay. Aphids are a common concern for this plant during spring and summer. These sucking insects can damage the leaves and ruin the display. Insecticide treatments may be necessary to control aphid spread. Powdery mildews are a concern for many climates on the waxflowers. These may occur at any time and can devastate the entire plant. Mildew control may be needed, as well as careful vigilance of leaves. Gray mold may also occur on the leaves if precautions are not taken. This often occurs when the humidity is high and temperatures moderate. It can quickly kill off a plant and spread to others if ignored. Waxflowers are often associated with riches and enduring wealth. They are popularly in areas around Rockford, IL, Lakeland, FL, Indianapolis, IN, Tuscaloosa, AL, and Coral Springs, FL. The long lasting blooms make them a symbol for lasting success. The waxflower may also be used as a sign of lasting love or patience.